Germany, Russia, Tartary, Turkey, The West Indies, etc. 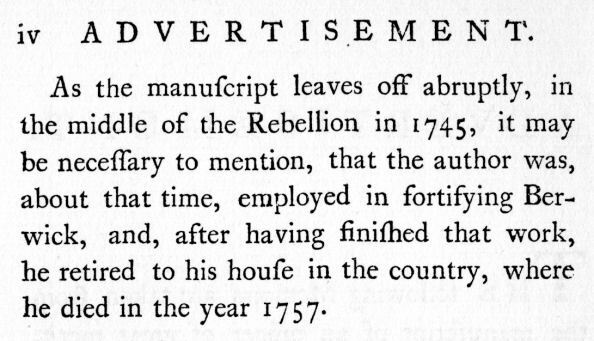 Note: You should note that this publication is written in the old style where the letter, lower case "s", is written as an "f". It doesn't take long to get used to this so hopefully you'll enjoy this publication. City of Novogorod. - The Sterlit fib. - Marshal Zeremetof's military mistakes. - The readiest method to get out of the Russian service. - The city of Petersburgh. - The czar's usual table. - His entertainments. - His present of boats to different ranks, and its good design. - An ambassador from Usbeck Tartary. - A naval excursion for his entertainment. - Cronstadt and Cronelet. - Oramanbaum, Petersboff, and Catharinhoff. - The grand dutchess born, and the prince's behaviour on the occasion. - His disrespect to the czar. - Naval expedition, in which the czar was rear admiral. - His gallant action with Ehrenshield. - He takes Aland. - His triumphal entry at Petersburgh. - Promoted to vice-admiral. - He complimnts Ehrenshield's bravery. - His speech to the senate. - His resentment of the czarowitz's disrespect. - He institutes frequent social assemblies and a royal academy. - Court-martial on Admiral Kruys. - The order of St. Catherine. - Confusions in the revenue, and the consequent distress. - Many delinquents punished. - Fiscals appointed. - The czar's public entertainments. - Mr Slitter's perpetuum mobile. - The old Findlander. - Hard frost at Petersburgh. - Experiements on bears. - Method of killing them. 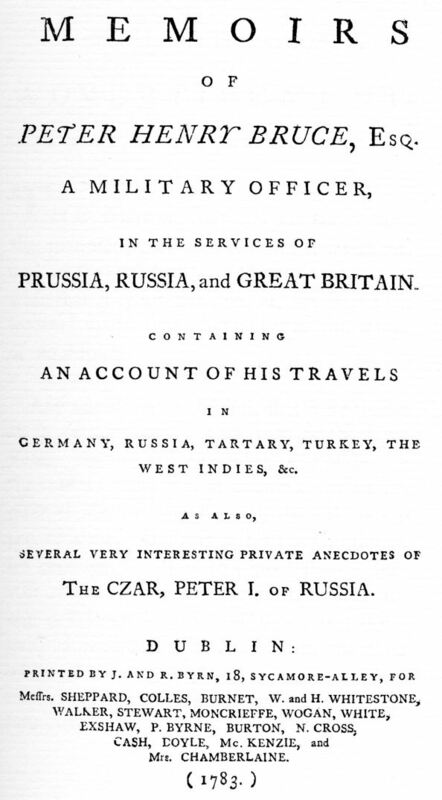 Return of the czarowitz from Moscow, and his esclusion from the succession. - His accomplices. - The prince, Mary concerned in it. - The trials of the czarowitz at Petersburgh. - His death and character. - The Swedish field-marshall Rheinshield's return home. - Negotiation at Aland, for peace with Sweden, renewed. - King of Sweden's death. - The death of baron Gortz. - The fiscal's information against the grandees for misdemeanours, and their trial. - Prince Gagaren's unaccountable behaviour. - More of the czarowitz's confererates. - Death of prince Peter Oetrowitz. - Prince Peter Alexowitz made a seargeant, taught his exercise, and made ensign. - Negotiations for peace renewed, but fruitless. - The czar resolves to command it. - Memorable descent on Sweden. - The British fleet come too late. - The czar disgusted with Britain. - The Jesuits banished. - The czar seized with a fit at Revil. 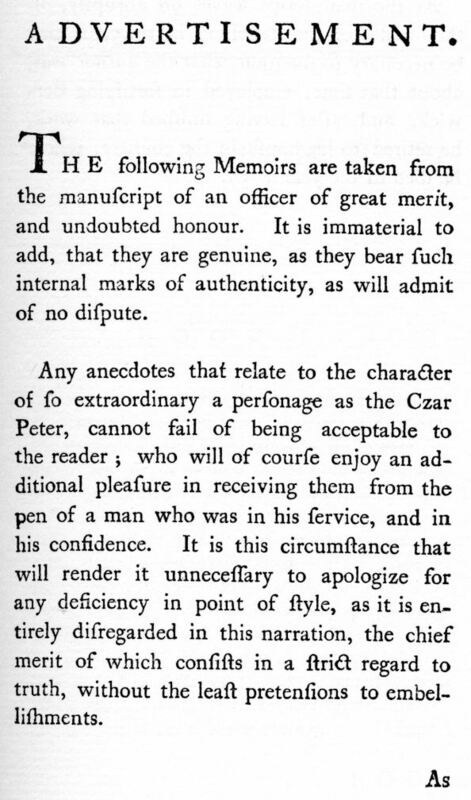 - General Weyde's illness, and the czar's concern for him. - Affairs of Sweden. - Marshal Weyde's death. - Ill treatment of his family. - His funeral. - The czar reproves Menzikoff. - Captain Bruce's inffectual attempt to quit the Russian service. - The new king of Sweden notifies his accession. - A second invasion. - The Swedes attack our fleet with loss. - The czar receives the duke of Holstein into his protection. - Court martial on lieutenant colonel Graves. A curious lawsuit between two brothers at Reval. - Fresh preparations against Sweden. - Proposals on their part, for a cessation of hostilities, rejected. - A third descent on Sweden, which obliged them to sign the preliminaries, and a child remarkdly preserves. - The fleet arrive at Petersburgh. - The czar honoured by his senate with the title of Peter the Great, &c. - A wise reformation in the benefits of the law. - The captain again refused leave to quit. - Triumphal entry into Moscow. - A proclamation and oath regarding the succession. The captain sent engineer to fortify Providence, and goes out in the Rose man of war. - Arrives at the island of Madeira. - Waits on the Portuguese governor. - Description of the island. - A hard passage to Carolina. - Misses a fine prize. - A violent storm. - The fortifications at Charlestown. - Arrives at Providence. The ruinous condition of fort Nassau. - Short history of the Bahama islands. - The oppresive practices of governor Fitzwilliam. - Governor Tinker succeeds him. - Short account of that gentleman. - The captain prevails on the inhabitants to carry materials for building fort Montague. - Nature of the stone. - and mastich wood. - Description of fort Montaque. - The governor's letter about it. - A quarrel with lieutenant Stewart. - The captain confined. - and set at liberty.